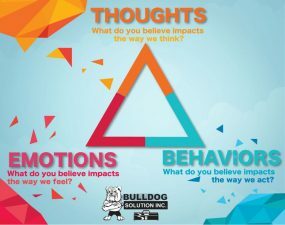 Our biggest goal at Bulldog Solution is to teach parents about the difference between bullying and drama. Over the past few years, it seems that everything is being labeled as bullying. From being called mean names to harassment, it all got put under the umbrella of bullying. As we label, we forget to explore why it happened, what was going on, and how they felt. When kids have the chance to explore how their emotions trigger the thoughts they have, they are more able to control the types of behaviors they express. Identifying emotions is a great tool to reducing drama and bullying. The simple act of talking about the emotions kids face can have a positive impact on their future interactions and gives them the time to self reflect. Let’s give them the time to think about how they feel and how they reacted. Emotions: are your feelings about a situation, yourself, or another person. Thoughts: are ideas about a situation or what we are thinking. Behaviors: are your actions or the way we react. How can I use my thoughts and emotions to make better choices? What can I do about my environment or situation? How can I change my environment or situation? How can I use my friends or family to help me? What can I do to better manage my emotions when I am mad or stressed? What emotions are the hardest to control? What behaviors can hurt you? What thoughts do you have when you are happy, sad, or angry? Using the Behavioral Triangle which we call BET is a great way to foster difficult conversations about bullying and drama. Try it and explore the different emotions your child might feel in a bad or uncomfortable situation. It is by processing our emotions that we learn.